Seminar at CCSM on common living in Gaza. The Catholic Center for Studies and Media (CCSM) in Jordan hosted on Saturday, November 3, a workshop on common living between Christians and Muslims in the Gaza Strip which was tackled by Dr. Jamil Salameh of the Islamic University in Gaza and secretary of the Palestinian Department of Dialogue and Reconciliation. In attendance were Latin Patriarchal Vicar for Jordan Bishop William Shomali, Sheikh Hassan Abu ‘Arqoub, Sheikh Hussein Al-Abdali, Fr. Ibrahim Nairouz, Fr. Simon Hijazin and Fr. Firas Hijazin, as well as a number of Christian and Muslim clergymen. The dialogue was moderated by CCSM Director Fr. Dr. Rif’at Bader. In his address, Dr. Salameh said that Palestine is a holy land as well as the focus of religious dialogue and a meeting place for the divine religions. He added that the common living between Christians and Muslims takes place by sitting at a round table for dialogue away from psychological barriers as well as in the spirit of brotherhood and citizenship, so that the meeting takes place at the level of decision-makers. 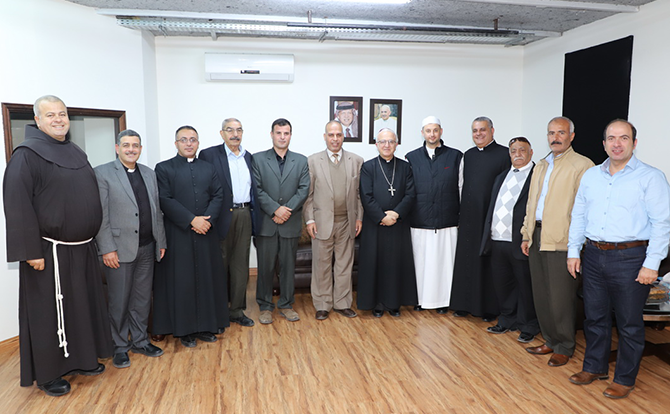 He reviewed the efforts designed to launch a dialogue between Christians and Muslims in Gaza in 2011, where a meeting was held between heads of churches and representatives of all factions in Gaza chaired by Patriarch Michel Sabbah and Fr. Manuel Musallam during which a consensus was reached on redrafting issues relevant to common living in the Gaza Strip that would be a symbol of common living. He added that several issues were discussed relevant to, licensing building churches, Christian waqfs, Christian judiciary, religious extremism, and Christian holidays. He pointed out that a Christian-Islamic declaration was signed in 2011, copies of which were placed in all churches and mosques. He pointed out that this declaration set the bases for religious harmony in an institutional way, which led to general satisfaction between Christians and Muslims in the Gaza Strip and resulted in reciprocal visits, holding workshops, in addition to teaching Christian and Islamic religions in schools. He pointed out that the document known as “Kairos Palestine”, which was issued in Bethlehem in 2009, represents the Christian the status of the Christian-Islamic community and its views with regards to the Israeli-Palestinian conflict. He stressed that this option led to concerted efforts and to the start of a rational dialogue focusing on common living. Bishop William Shomali stated that all dialogues should be based on sincerity because that is crucial to our existence. He added that our survival hangs on the political and economic problems so that we must emphasize our harmony and common stands. Stressing that we should not feel that we are strangers and unaware of the existence of the other party, he pointed out that the Church has several Christian institutions that provide sublime educational services to the community in Gaza. He added that the Christian presence in Gaza is qualitative, rather than quantitative, and that it is invaluable. On his part, Sheikh Abu ‘Arqoub hoped that the dialogue would be extended to the public, as it would not remain confined to the intellectuals while hardly influencing daily life. A lengthy debate ensued during which the participants emphasized that evicting a society from Christians represents the removal of the soul from the body. They are stressed the need to have what is agreed upon in meetings become a reality, underlined that Christian-Islamic unity is a source of strength in the face of forces of darkness, and pointed out that the divine religions convey a message of love. Dr. Salameh concluded the seminar by calling for addressing the decline in Christian presence in the region, noting that Christianity emerged in Palestine and spread to all parts of the Earth. He stressed that the Christian-Islamic dialogue has been sprouting up in social, political and developmental life.